That doesn't mean it won't make you jump. The Evil Within 2 is weird, gross and scary, but that's okay. It balances all that with exploration and figuring out what the hell is going on. I can then get back to fleeing disgusting buzzsaw creatures -- or occasionally stabbing them in the chest -- at my leisure. The Evil Within was never about cheap jump scares, but the game was so consistently tense and bleak that many found it pretty hard to play through. The sequel, playable at Gamescom this year, looks to be a refinement of the original, making it altogether more playable, even if there's still usually something trying to kill you at every turn. I sat down with John Johanas and Shinji Mikami to talk about what's changed. Resident Evil creator Mikami is now the producer and creative supervisor, as Johanas takes up the director role for The Evil Within 2. Both noted that, with the sequel, the emphasis was on expanding the world and fleshing out the sometimes hard-to-understand story of the original. "We decided to go back to [the protagonist] Sebastian. This is his tale of discovery, of redemption," said Johanas. "Everything is based on that." To that end, the gameplay and controls haven't changed in any major way, just some refinements based on player feedback. There's a greater focus on how much you get to understand about Sebastian Castellanos -- the detective whose life was ruined by the events he survived in The Evil Within. What motivates him now is the chance that his daughter, thought dead, could be alive. In order to rescue her, he has to go back into the messed up STEM world — that's where all the faceless creatures and messed-up monsters are. Fantastic. 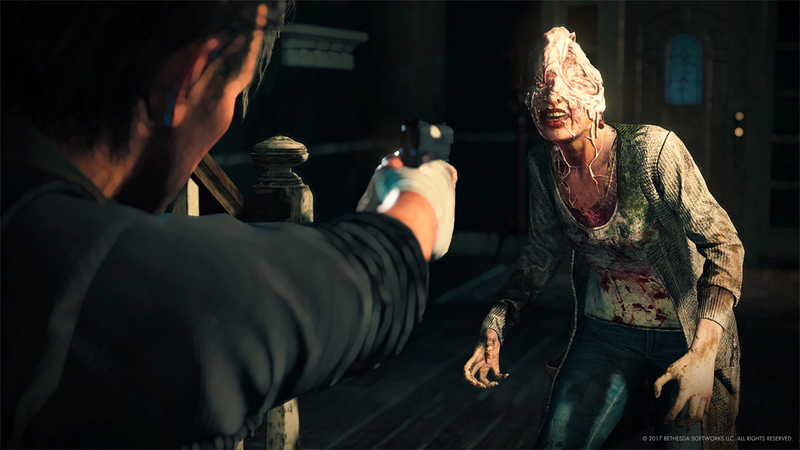 While the original game was relatively linear, The Evil Within 2 offers more exploration, bigger areas and more chances for independent thought and play. I got to test out the second and third chapter. The first half of my playthrough was a relentless chase from some stitched-together monstrosity. I fumbled the controls and managed to get the former detective maimed twice before making it to the next chapter, where the tempo completely changes. Castellanos discovers he's on the outskirts of a village, and after tackling a demonic mom that's force-feeding her soon-to-be-dead 'son', he makes his way into a suburb overrun with more zombie types. After crafting some bullets at my new safe house, I heard someone's voice coming from inside the new church. As the last lucid human turned out to be helpful, I thought I might find another recruit. A priest inside was praying to the cross on the altar. There was already a corpse skewered on said cross. As I approach, demonic light burst from his mouth and he's transformed into.. something bad. Suddenly, a monster appears behind me while another crashes through the church window. By the end, I'd used up all of those just-made bullets. I had time to creep around at my own volition, but there was also enough going on, even in this early area, to keep me busy and, well, tense enough. Horror-action games can often be a bit too much for me, and many noted that the original Evil Within suffered from an often on-the-rails sense of relentless scares and horrors. Johanas says that they paid particular attention to both the pacing and to encourage more exploration in-game. With expanded game areas, and attempting to offer gamers a deeper insight into what motivates the protagonist and even the unhinged antagonists, it all adds up to a bigger creative task than the original. For Mikami the biggest challenge was time, and lack of it. Johanas added: "Delivering the more abstract ideas and notions of the mind: these kind of puzzles take time to make. I wish we'd have been able to make more of those." I asked him if there was anything too graphic, too messed-up that they simply couldn't put into the sequel. "Not really. In the first game, the player was handling brains in order to solve a puzzle. Once you've done things like that, there's not much we can't do," quipped Johanas. The game is set to arrive October 13th on Xbox One, PlayStation 4 and PC.